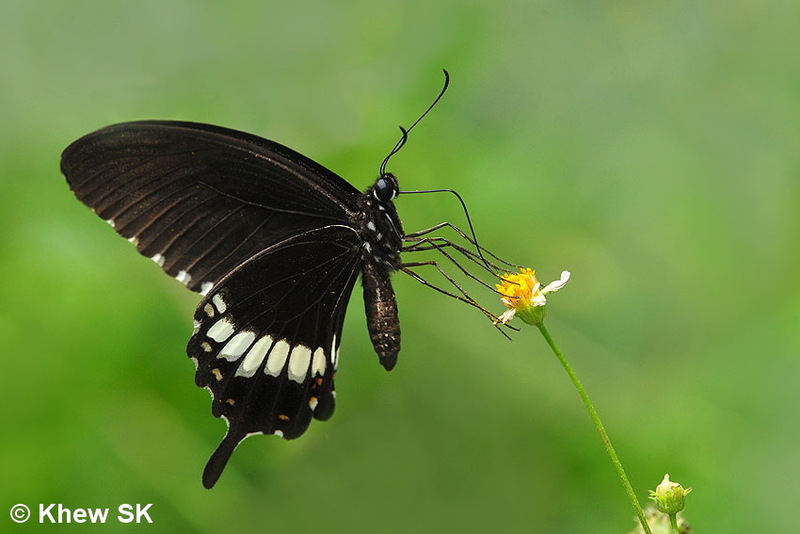 Many species of the Swallowtail family (Papilionidae) have a unique way of flapping their forewings rapidly whilst their hindwings are held relatively still. This is particularly evident when the butterfly is feeding at flowers. The butterfly targets a flower, flies in and holds the flower with its legs, whilst flapping its forewings rapidly to balance itself and then simultaneously probing the flower for nectar with its proboscis. For a butterfly photographer, shooting a Swallowtail in flight is challenging, and often a case of anticipation and luck. To 'freeze' the flapping forewings, a shutter speed of above 1/500s is usually required - for the relatively slower-flying Common Mormon as is shown here, and beyond even 1/1000s when shooting the more rapidly flying species like the Graphiums. An article about shooting Swallowtails is found here.